COSMETIC SCALP PIGMENTATION IS A NOVEL AND PERMANENT HAIR LOSS SOLUTION. BUT CAN HAIR REPLICATION STAND THE TEST OF TIME? 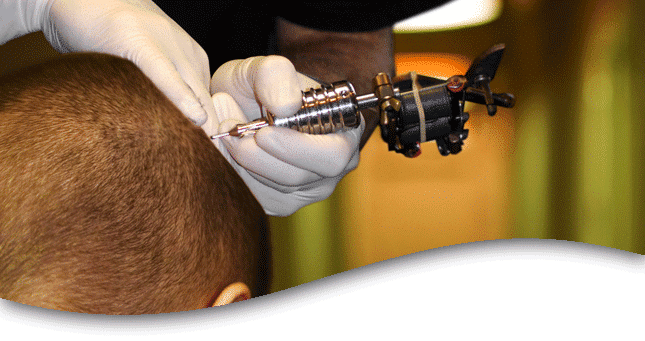 Skin tattooing – permanent pigmentation of the scalp – is being used in studios and hair clinics as a technique to conceal hair loss. Like a pointillist painting, the sum of thousands of tiny dots creates a generalized impression of a full-haired but shaved head. Men who prefer a very short “buzzed” or shaved hairstyle use this look. On them, the micro skin pigmentations replicate what the follicles would look like – if they were still there, actively producing hair. Women and men with longer hairstyles might use the technique to darken the scalp where they part thinner hair, or in a bald patch caused by something other than male or female pattern baldness. This effect is similar to topically applied concealers – except that tattoo hair replication will not wash out. To be clear, hair replication varies between companies providing the treatment and, arguably, from artist to artist. A poor execution would include an unnatural hairline, or the use of pigments and applications that would lead the hair replication to “bleed” and fade (turn green) with time. Some companies claim to have overcome these issues with newer dyes and application techniques. If the answer is a firm “yes,” he or she needs to study the technique and its purveyors carefully before making that commitment and choosing this option.